I love sushi. I love eating sushi. But , MAKING sushi is something that I have never attempted. Many of my friends have told me that it is really not that hard, but there is something very daunting to me about even thinking about trying to recreate those delicate looking morsels. Equally scary is the idea of working with raw fish and very, very sharp knives to get ingredients sushi ready. When some friends told me about a GroupOn deal for sushi making lessons at the Thompson hotel, I was on board. It was about time I try my hand at making something I love to eat so much! 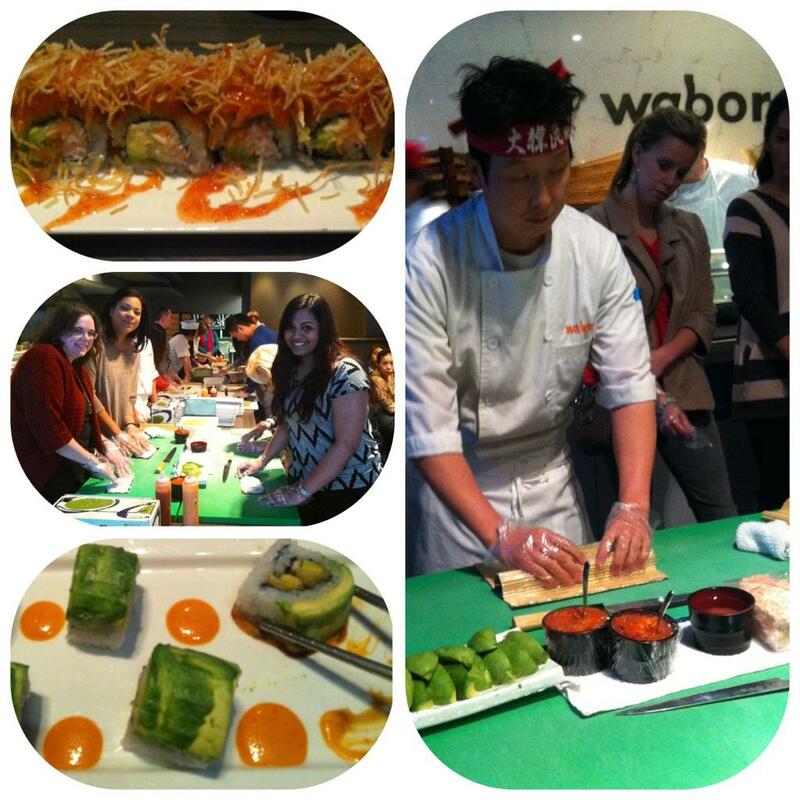 The GroupOn voucher was $35.00 for a two hour sushi making class at Wabora Fusion Japanese Restaurant. We would learn to make two rolls. We actually purchased the voucher over two months prior to our class. Classes were filled up , and we wanted a Saturday date. This is something to keep in mind if purchasing a similar Wabura sushi making voucher. 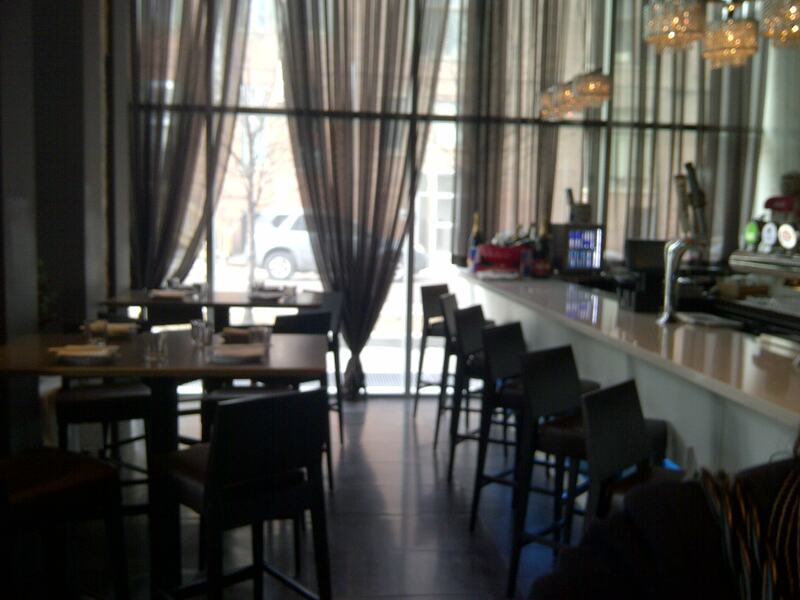 Wabura is located in the chic Thompson Hotel. It is a sleek and modern Japanese fusion restaurant. I was looking forward to trying the restaurant’s fare as GroupOn had detailed the freshness of the ingredients. “The Wabora Fusion Japanese Restaurant owner came to Canada from his native South Korea at age 15 to play minor-league baseball, a gig that took him across North America and, incidentally, exposed him to all kinds of regional cuisine. Now that he’s traded bats and balls for knives and rolls at Wabora, he’s still on the go. 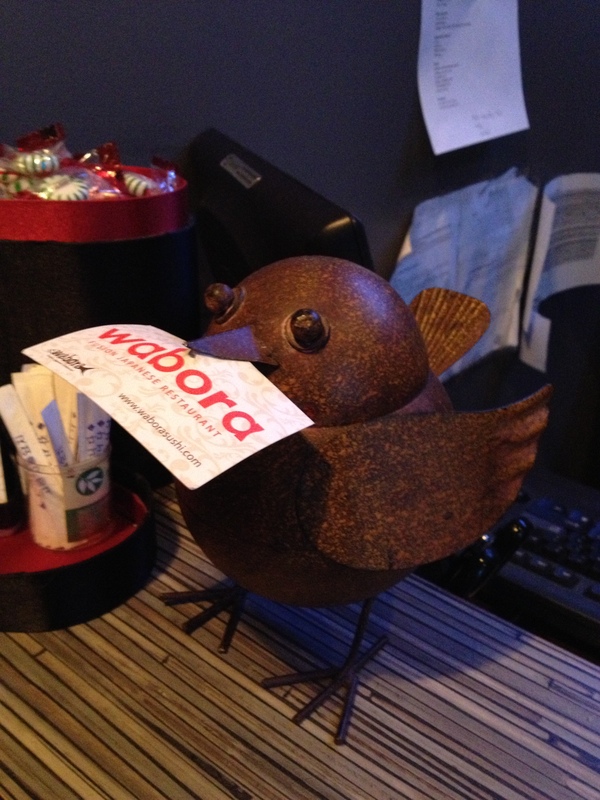 Each day he travels to Toronto to pick up fresh ingredients and bring them back to Wabora’s Bracebridge location”. Impressive. When we entered the restaurant we were greeted and asked to show our vouchers. Taxes for the voucher were $5.20. We paid, checked our coats and got settled at a table while we waited for the class to commence. 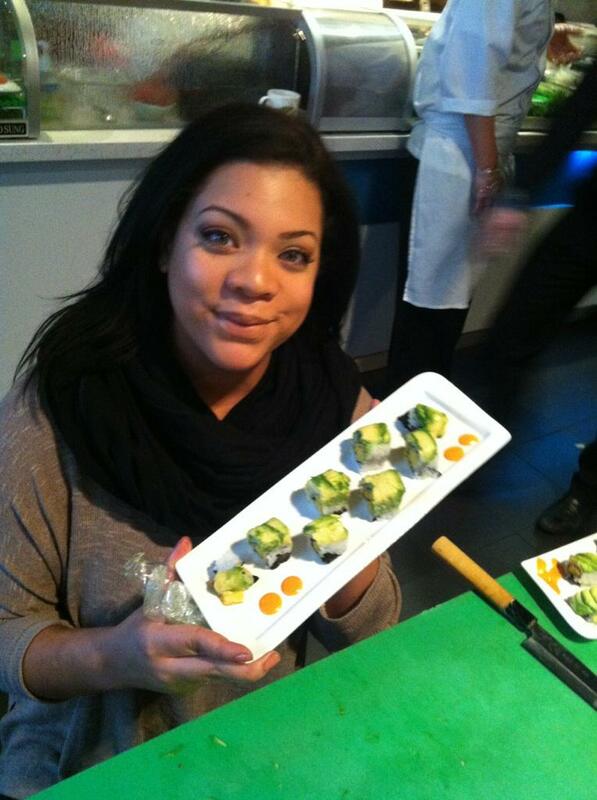 The class began with a teacher , along with two chefs that demonstrated how to make a yam tempura roll. We marvelled at the chef’s knife skills as he cut a small piece of avocado into paper-thin slices. Then it was time for the students to give it a try. The class was about forty people and there were six stations where two people could work at a time. We ended up waiting quite a while to make our rolls. We were last up and making the yam roll was easier than we anticipated. We were given egg sized heaps of sushi rice already mixed with sushi vinegar that we spread on to a sheet of seaweed. We rolled some pre-made strips of tempura yam inside and tightly packed it with a sushi roller. Then came the tricky part. We attempted to make thin, delicate slices of avocado and then fan them atop the roll as we were shown. We found that when we packed the roll again and sliced with cling wrap, it kind of all smushed together and looked pretty professional. Lesson #1 of the day- Sushi rolls are very forgiving. Lesson #2 – Sushi rolls require a LOT of plastic cling wrap. Finally finished our very first roll. We were hungry and excited. Not so fast though. As we sat down to eat, it was time to start our second roll lesson. The second roll that was demonstrated was a Wabora specialty called the Crispy Valentine Roll. This is a california roll topped with spicy salmon and shredded crunch potatoes along with Wabora special sauce. Yum! We followed the same steps that we had with our first roll, only this time adding delicious spicy salmon and topping with crispy potato straw. 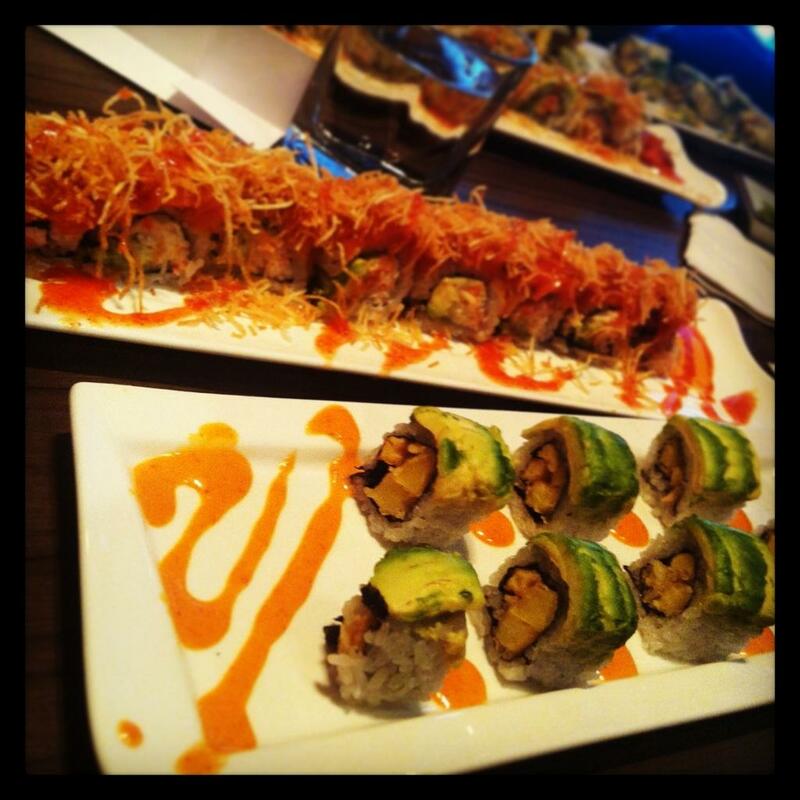 We got to go first this time so this roll came together quickly and we were soon seated with our two creations. It was certainly a unique and rewarding experience to be seated at a table in a luxe resto-bar , dining on sushi that you made and plated yourself. The rolls were fresh, delicious and surprisingly filling. I don’t know that we would be able to recreate the exact rolls we made at home, as some of the more daunting steps were already completed for us. The rice was already prepared with vinegar, yam was already tempura battered and cooked, and who the heck knows how to make crispy potato string? However, we certainly learned the basics of making sushi rolls, and I am now confident that I could utilize that with alternate ingredients in my own home. My only criticism of the class was that it was definitely over booked. The restaurant could have also added more stations if this were the case. I think it would have been more efficient if each student, or even every two people had a work station of their own. I still highly recommend this sushi making experience at Wabora. Keep an eye out , as it seems to surface periodically on group buying sites. It was an excellent value as you will get not only a beginner’s lesson in sushi making but also a delicious meal. I look forward to returning to Wabora soon, this time to try something I haven’t made myself! Have you ever made sushi before? The Beauty Balm Series: Beauty Bomb or Da Bomb? I can make precisely two rolls… if the ingredients are prepared for me. Haha! I’ll be your sous-chef and do all the cutting! If you are interested in this class, GroupOn is offering it again this weekend!